The CryoTrap can be used in combination with the OPTIC-4 and will be controlled from the same unit and software. 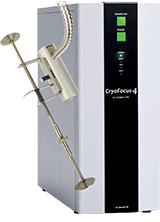 With this combined unit (CryoFocus-4 and OPTIC-4) both the inlet and cold trap are controlled via the Evolution Workstation software that is used with the OPTIC-4. In the situation that a CryoFocus-4 (only a cold trap) is used we have a different version of Evolution Workstation that is able to control only the cold trap.